With three trials held in Derbyshire and one in Cheshire, last weekend was a busy one for handlers living in those regions. On Saturday, Hayfield held its third trial with concluding championships on elevated ground between Glossop and Hayfield. Tom Weston judged the trial entry of 30 dogs, followed by the two championships each with three runners. In the trial, Jim Hussey ran novice dog Highgate Hill (G. Hallam’s Harriot Queen, R. Saxon’s Cammen Rip) early at number four. Red and white Hill earned the top novice score of 76 points. Peter Wood and Joe (R.E. Lewis’ Denwyn Ruby, A. Owen’s Llangwm Cap) ran at 15. Working his sheep from a distance, Joe kept them settled to earn the top nursery score of 79. In the novice championship Jim and Hill ran last. Hill had an excellent start, losing just two points from his fetch. He slipped a sheep at the first drive obstacle and lost a total of nine points throughout his driving before putting his ewes straight through the chute. The sheep were difficult to shed and after one failed attempt some time passed before a second opportunity arose. Hill took his shed with one second to spare and with 84 points won the novice championship. David Wood and Lyn, a litter sister to Peter Wood’s Joe, were first to run in the nursery championship. For being tight towards the end of her right hand outrun Lyn lost four points, two points went from her lift and four from her fetch. Going for a tight turn, two sheep slipped in front of the first drive hurdle. She dropped five points in total from her driving. Slight hesitation at the chute cost one point before a faultless shed gave the winning score of 83. Although not placed on Saturday having won the two previous trials, Mark Hallam and Upland Cap won the nursery aggregate. The novice aggregate went to Gordon Birchenall and Dan. Although Mark Hallam and Upland Cap (P. Hallam’s Gem, J.B. Wilde’s Roy) had no luck on Saturday, on Sunday it was quite the reverse. With an early run at Bamford, working mixed ewes over a flat course they took the nursery title clear by six points. Run 13 at Hope proved lucky for them. This time working mixed ewes over a course which rose to the lift with a single point advantage they took their second title of the day. Since the start of the season this was their sixth win. Finally they competed at Rainow where they were the runners up to James Gilman and Bonnie. HAYFIELD, The Grouse, between Glossop and Hayfield, Derbyshire (Judge, T. Weston, Chesterfield) Nursery (30 ran) 1, P. Wood (Derwent Valley) Joe, 79 of 90; 2, D. Wood (Derwent Valley) Lyn, 75 OLF; 3, S. Cottrell (Congleton) Mac, 75; 4, J. Howard (Holme) Lad, 74; 5, D. Wood, Craig, 73; 6, A. Ritakallio (Neston) Kipi, 72. Nursery aggregate, M. Hallam (High Peak) 223 of 270. Novice 1, J. Hussey (Alderley Edge) Highgate Hill, 76 of 90; 2, P. Boon (Congleton) Bett, 75; 3, G. Birchenall (Chinley) Dan, 73. Novice aggregate, G. Birchenall, Dan, 222 of 270. Nursery championship (3 ran) 1, D. Wood, Lyn, 83 of 100; 2, P. Wood, Joe, 78; 3, M. Hallam (High Peak) Upland Cap, 75. Novice championship (3 ran) 1, J. Hussey, Highgate Hill, 84 of 100; 2, J. Conway (Glossop) Mist, 78; 3, G. Birchenall, Dan, 70. BAMFORD, Shatton, Bamford, Derbyshire (Judge, A. Wilkinson, Thurgoland) Nursery (32 ran) 1, M. Hallam (High Peak) Upland Cap, 77 of 90; 2, J. Cropper (Deerplay) Dan, 71; 3, D. Wood (Derwent Valley) Craig, 69; 4, O. Walters (Oughtibridge) Megan, 67 OLF; 5, C. Kempson (Cowpe) Fleet, 67; 6, J. Scrivin (Elslack) Nell, 65. Nursery aggregate, O. Walters, Megan 188 of 270. Novice, 1, G. Birchenall (Chinley) Dan, 76 of 90; 2, J. Saxon (Crowden) Jill, 64; 3, J. Hussey (Alderley Edge) Highgate Hill, 63; 4, L. Bone (Holmfirth) Blue, 61. Novice aggregate, J. Saxon, Jill 116 of 270. Beginner, D. Hayes, Peggy. HOPE, Castleton Road, Hope, Derbyshire (Judge, J. Fletcher, Chesterfield) Nursery (44 ran) 1, M. Hallam (High Peak) Upland Cap, 78 of 90; 2, S. Wilkinson (Thurgoland) Huthwaite Kep, 77; 3, N. Vyas (Wigston) Cody, 76 OLF; 4, C. Kempson (Cowpe) Fleet, 76; 5, B. Dumbleton (Bollington) Max, 75 OLF; 6, J. Cropper (Deerplay) Dan, 75. Novice, 1, G. Dermody (Nantwich) Mist, 76 of 90; 2, J. Saxon (Crowden) Jill, 72; 3, J. Hussey (Alderley Edge) Highgate Hill, 69. Beginner A. Priestley (Bamford) Matt, 67. RAINOW, Yearnslow Farm, Rainow, Macclesfield, Cheshire (Judge, H. Owen, Nantwich) Nursery (37 ran) 1, J. Gilman (Bosley) Bonnie, 78 of 90; 2, M. Hallam (High Peak) Upland Cap, 67; 3, J. Richardson (Strinesdale) Ceri, 64 OLF; 4, N. Vyas (Wigston) Cody, 64; 5, D. Wood (Derwent Valley) Lyn, 60; 6, S. Evans (Holcombe) Tess, 50. Novice 1, J. Hussey (Alderley Edge) Highgate Hill, 73 of 90; 2, G. Birchenall (Chinley) Dan, 68; 3, G. Birchenall, Marchup Leaf, 67. Beginner, 1, C. Robson (Stockport) Belle; 2, C. Dumbleton (Bollington) Dot; 3, C. Wood (Hayfield) Joey. Young handler, C. Dumbleton, Dot. RYEDALE, Cawton, East Gilling, North Yorkshire (Judge, L. Jones, Wrelton) Nursery (25 ran) 1, R. Jewitt (Naburn) Queen, 94 of 100; 2, S. Beaton (Nun Appleton) Milly, 90; 3, C. Cutler (Easby) Beth, 90; 4, J. Read (Louth) Jimmy, 90; 5, J. Simpson (Hutton Rudby) Jill, 85; 6, G. Blyth (Roos) Calderdale Roy, 81. YORKSHIRE, Moor Lodge Farm, Oakworth, Keighley, West Yorkshire (Judge, P. Fox, Withgill) Nursery (19 ran) 1, J. Cropper (Deerplay) Glen, 82 of 90; 2, J. Scrivin (Elslack) Nell, 79; 3, J. Cropper, Dan, 78; 4, C. Mellin (Oakworth) Rainow Max, 76; 5, I. Ibbotson (Oakworth) Spot, 75; 6, S. Cropper (Deerplay) Sid, 74. TRAWDEN, Higher Twiston, Clitheroe, Lancs (Judge, I. Salter, Foulridge) Nursery (43 ran) 1, Michael Longton (Quernmore) Rooten Brook Bute, 83 of 90; 2, H. Taylor (Skelsmergh) Roo, 82 OLF; 3, Thomas Longton (Quernmore) Oz, 82; 4, A. Dewhurst (Winterburn) Izzy, 81; 5, Tim Longton (Quernmore) Rooten Brook Roy, 79; 6, L. Bancroft (Barnoldswick) Alf, 76. SHROPSHIRE and HEREFORDSHIRE, Middleton, Ludlow, Nursery, 1, A. Bennett (Hyssington) Taddymoor Cap. Novice 1, P. Thomas (Longnor) Fran; 2, L. Jones (Hope) Tess; 3, S. Fullwood (Picklescott) Midge; 4, J. Grocott (Baschurch) Millie. NORTHERN, Halfpenny House, Barden Moor, Leyburn (Judge, D. Bowmer, Scotton) Nursery (40 ran) 1, G. Redpath (Dacre) Zoe, 82 of 90; 2, C. Cutler (Easby) Beth, 81; 3, J. Edgar (Consett) Redgate Trim, 81; 4, A. Baines (South Stainmore) Tanhill Sue, 78; 5, R. Fawcett (Hardraw) Ash, 77; 6, S. Atkinson (Waitby) Nip, 71. Committee Novice 1, M. Metcalfe (Wharton) Boris, 85 of 100; 2, P. Schellhorne (Ferryhill) Roy, 74; 3, L. Morland (Hamsterley) Trixie, 68. New Handler S. Roper (Cleator Moor) Skye, 45 of 50. NORTH WESTMORLAND, Portinscale, Keswick (Judge, W. Bell, Earby) Nursery (48 ran) 1, J. Graham (Ambleside) Sally, 77 of 90; 2, Thomas Longton (Quernmore) Oz, 73; 3, M. Glasgow (Stodday) Mist, 72; 4, M. Beaty (Laithes) Jim, 69; 5, S. Atkinson (Waitby) Nip, 67; 6, M. Jones (Howtown) Pip, 66. Novice 1, L. Cowper (Threlkeld) Flo, 77 of 90; 2, A. Temple (Holmrook) Jan, 76; 3, S. Atkinson, Gem, 70; 4, T. Blease (Watermillock) Queen, 67. New handler 1, S. Roper (Cleator Moor) Skye; 2, M. Fearon (Borrowdale) Del. NORTHUMBERLAND League, Healy Mill, (Judge, P. Turnbull, Rothbury) Nursery (21 ran) 1, M. Northwood (East Woodburn) Llangwn Floyd, 83 of 100; 2, D. Henderson (Allendale) Jill, 80; 3, B. Jordan (Whitfield) Bozo, 75; 4, P. Telfer (Haydon Bridge) Kettle, 74; 5, M. Davidson (Wooler) Tom, 71; 6, S. Smith (Sea Houses) Gail, 67. Novice, C. McNulty (Wooler) Kim. New handler, C. Pattinson Jean. MORETON, Chadshunt, Kineton, Warwickshire (Judge, R. Smith, Chipping Norton) Nursery (42 ran) 1, J. Saukkonen (Warwickshire) Gannon, 79 of 90 OLF; 2, A. Blackmore (Ledbury) Ren, 79; 3, J. Porter (Broughton Astley) Spot, 79; 4, K. Addington (Kettering) Meg, 78; 5, A. Tomkinson (Melton Mowbray) Flint, 77; 6, R. Montgomery (Bristol) Hemp, 74. Novice 1, L. Amos (Stow on the Wold) Nesta, 86 of 100; 2, J. Porter Jo, 85; 3, J. Porter Lad, 78; 4, A. Blackmore Joe, 73. Open, 1, R. Montgomery, Gail, 90 of 100; 2, L. Amos, Fleet, 90; 3, S. Neeson (Burton on the Wolds) Queen, 89. SUSSEX, (Judge, A. Jackman, Brockham) Nursery 1, Ray Edwards (Chulmleigh) Clyde, 88 of 100; 2, Ray Edwards, Mick, 80; 3, J. Bastable (Tonbridge) Pip, 74; 4, M. Banham (Chipstead) Ollie, 68. Novice 1, Ray Edwards, Kate, 83 of 100; 2, J. Robertson (Henfield) Crisp, 80; 3, Ray Edwards, Jet, 71; 4, S. Walker (Stelling Minnis) Karven Griffin, 67. Novice handler, I. Wheeler. WEST COUNTRY, Middle Merripit Farm, Postbridge (Judge, P. Symons) Maltese cross (37 ran) 1, J. Watson (Postbridge) Spot, 60 of 70; 2, T. Parson (Bristol) Lil, 53; 3, J. Watson, Huthwaite Roy, 50; 4, J. Watson, Fleet, 48. Driving (14 ran) 1, J. Nicholls (Buckland Brewer) Rob, 78 of 100; 2, J. Watson Jill, 71 OLF; 3, D. Herd (Cornwall) Tan, 71; 4, L. Zorab (Somerset) Tweed, 70 OLF; 5, D. Cole (Bittaford) Jess, 70; 6, T. Rofe (Chilla) Maggie, 64. Young Handlers (5 ran) 1, C. Fritsgeral (New Forest) Del, 59 of 70; 2, L. Hopper (Veryan) Fern, 48; 3, W. Carter (Delabole) Jo, 46. New handler (11 ran) 1, M. Evans (Holsworthy) Ben, 53 of 70; 2, C. Watson (South Brent) Flow, 47 OLF; 3, R. Skelly (Wotter) Midge, 47; 4, M. Snuggs (Dorset) Lass, 40 OLF; 5, C. Snuggs (Dorset) Nan, 40; 6, A. Turner (Bude) Shan, 39. November 12. FYLDE, Nursery, Pott Yeats Farm, Littledale, Lancashire, LA2 9ET, 9am start, enter on field, those with two dogs must be booked in by 12 noon. HOLME, Nursery, Higher Wall Farm, Lumb, Lancashire, BB4 9NE, 9am start, enter on field, those with two dogs must be booked in by 12 noon. RYEDALE, Nursery, Kirby Misperton, Pickering, North Yorkshire, 10am start, enter on field by 1pm, more than one dog first by 12 noon. WEST COUNTRY Nursery, Driving then Maltese cross, Ashridge Court, North Tawton, EX20 2DH, 10am start, enter on field. November 13. FOXT and DISTRICT, Nursery, Novice and Beginner, Staffordshire, ST10 2HN, contact P. Hallam for exact location on tel 07817 716 414, 9am start, enter on field by 12 noon, catering. NORTH WESTMORLAND, Nursery, Novice and New Handler, Portinscale, Keswick, CA12 5SP, 9am start, enter on field by 1pm, those with three dogs two to be booked in by 12 noon, novice confined to Cumbria. NORTHERN, Open, change of venue to Hamsteels Hall, Quebec, Durham, DH7 9RS, 9am start, for two dogs first to be booked in by 12 noon, last entry 2pm, entry closed. NORTHUMBERLAND League, Nursery and New Handler, Dunterly Farm, Bellingham, NE48 2JZ, 11am start, enter on field. ROMNEY MARSH, Nursery, Novice, Novice Handler and Cradle, Whitehall, Ludgate Lane, Lynsted, Sittingbourne, Kent, ME9 0RF, 10am start. THE last run of the day at the Dryden nursery saw Davie Gilchrist’s Jade take the lead over a high standard of competition in torrential rain. Jade ran out and lifted flawlessly and had only minor wavers on the fetch and drive. A clean pen followed and a good, if slightly hesitant, shed completed the run in first place, pipping the erstwhile leader into second place by a single point. Mark Arres stood first and second, with Doug and Moss, respectively, until Jade pushed them both one step down the ranking. The Great Glen confined trial at Inverroy opened with a minute’s silence in memory of Great Glen SDT society’s stalwart and long time treasurer, Ewen Campbell, who died recently. A deep gully ran up the right-hand side of the gently sloping Inverroy course. Field drains and soft patches on the fetch and drive made good lines difficult to achieve with the packets of four ewes of mixed breeds. John MacKillop’s Straid Sam ran out well and lifted cleanly. The line of the fetch wavered slightly, but Sam got his gates, and turned neatly on to the drive. Sam turned the sheep so tightly at the first drive gates that two came back through. The work went well from there and the pen was clean; a competent shed completed the winning run. DRYDEN (Judge, R. Lyon, Hawick) Nursery (14 ran) 1, D. Gilchrist (Oxton) Jade, 93; 2, M Arres (Ashkirk) Doug, 92; 3, M Arres (Ashkirk) Moss, 90; 4, J. Robinson (Coldingham) Jill, 89; 5, A. Dickman (Oxton) Jake, 85; 6, C. Dickson (Coldingham) Lethens Craig, 81. Novice, 1, P. Howe (Hawick) Pip, 79; 2, P. Howe (Hawick) Mirk. GREAT GLEN, Inverroy (Judge, J. Ferguson, Carnoch) Confined (21 ran) 1, J. McKillop (Fort Augustus) Straid Sam, 83; 2, J. McKillop (Fort Augustus) Joe, 80; 3, B. Strachan (Roybridge) Sam, 76; 4, M. MacNally (Invergarry) Jock, 74 Outbye; 5, B. Strachan (Roybridge) Jim, 74; 6, I. Wilson (Knoydart) Dusk, 71. THE annual competition between the counties of Carmarthenshire, Ceredigion and Pembrokeshire, was hosted by Irwel Evans at Bwlch y Ddwyallt near Pontyrhydfendigaid. Teams from each county ran their dogs on a challenging up hill course. The dogs were out of sight for part of the 400-yard outrun. The drives were lengthy at over 100 yards for each stage. 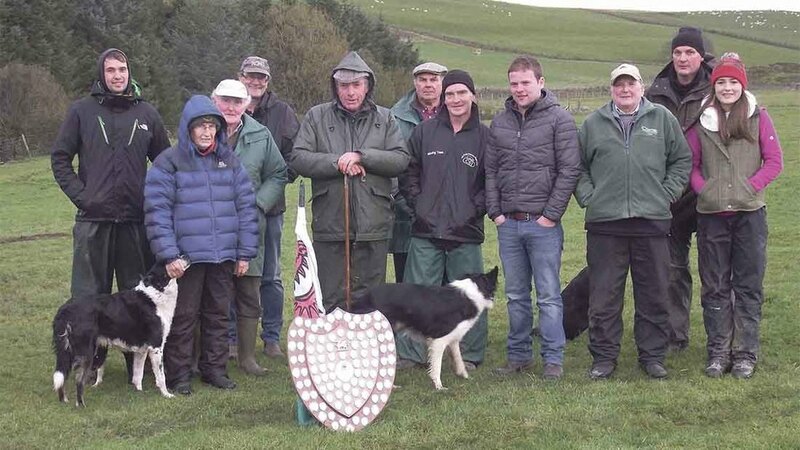 At the end of the day, Ceredigion’s handlers had the highest overall score and were awarded the shield. The individual winner was Nigel Watkins, Carmarthenshire, with four-year-old Tanhill Alex, who is a son of I.B. Jones Tim, out of Alex Baines’ Jess. The pair put in a smooth and controlled run, which lost them only 11 points around the course. Fourteen-year-old Logan Williams took the young handler prize with Ned. PANTHOWELL CARMARTHENSHIRE (Judge, Angie Driscoll) Nursery, 1, N. Watkins, Fly, 10; 2, M. Jones, Nan,11; 3, L. Williams, Ned, 15; 4, N. Watkins, Queen, 16; 5. S. George, Gwen, 20; 6, S. Lewis, Gwen, 26. Puppy class, 1, M. Jones, Nan, 11; 2, S. Lewis, Gwen, 26; 3, S. Lewis, Jess, 29 OLF; 4, O. Bennett, Mai, 29; 5, T. Mallon, Lola, 52; 6, M. Hemmings, Penny, 59. PENYGRAIG GLOS/GWENT (Judge, Jamie Garland) Nursery, 1, A. Blackmore, Rosewood Ren, 6; 2, R. Mumford, Bryn-yr-Orsedd Jack, 14; 3, A. Blackmore, Nip, 23; 4, G. Jones, Craig, 27; 5, L. Amos, Comedha Nesta, 28; 6, S. Currie, Sawmill Floss, 30. Novice, 1, A. Blackmore, Spot, 5; 2, L. Amos, Comedha Nesta, 12; 3, A. Blackmore, Rocky, 13; 4, S. Currie, Sawmill Floss, 15; 5, B. Morgan, Sawmill Gwen, 23; 6, G. Jones, Craig, 24. TREGUFF FARM GLAMORGAN, Nursery, 1, R. Millichap, Max, 8; 2, D. Howells, Rock,18; 3, R. Ellis, Jim, 20; 4, D. Howells, Gwen, 28; 5, Carly Millichap, Lexi, 33; 6, L. Bowden, Don, 36; Novice, 1, D. Howells, Gwen, 20; 2, H. Llewellyn, Taff, 27; 3, L. Bowden, Lad, 28; 4, L. Bowden, Don, 3; 5, Cerys Millichap, Milly, 36. PENYBANC FARM CEREDIGION (John George) Nursery National style, 1, D. Jenkins, Bill, 12; 2, J. Price, Sam, 13; 3, D. Rees, Meg, 14; 4, Gwyn Davies, Bill, 17; 5, M. Morgan, Queen, 31. South Wales style, 1, J. Davies, Sid, 10; 2, D. Jenkins, Bill, 26; 3, Gwyn Davies, Bill, 27; 4, A. Davies, Floss, 32; 5, E. L. Morgan, Craig, 35; 6, D. Rees, Meg, 35. TREMYNYDD FACH PEMBROKESHIRE (Judge, Stan Harden) Nursery, 1, C. Ridge, Blue, 16; 2, I. Harries, Preseli Fly, 30; 3, J. Bowen, Tess, 39;4, A. Morgan, Spot, 41; 5, C. Darlington, Dolly, 46; 6, T. Harries, Meg, 50 OLF. Puppy class,1, C. Darlington, Dolly, 46; 2, C. Soar, Zeta, 55. Sweepstake, S. Harden, Bob. PENYBONT RADNORSHIRE (Judge, Nigel Price) Nursery 1, M. Owen, Denwyn Annie, 14; 2, P. Tomkins, Lynn, 15; 3, G. Powell, Tess, 18; 4, P. Tomkins, Roy, 24; 5, K. Haker, Elsa, 37; 6, A. Price, Spot ,39. Novice, 1, B. Lewis, Fan, 20; 2. K. Haker, Holly, 23; 3, J. Simmons, Conner, 39. New handler, P. Watson Jones, Jose. GLADESTRY RADNORSHIRE (Judge, Ken Powell) Nursery, 1, P. Tomkins, Lynne, 11; 2, M. Owen, Denwyn Annie, 12; 3, B. Pugh, Roy, 13 OLF; 4, G. Powell, Mot, 13; 5, K. Haker, Fynydd Elsa, 14; 6, B. Lewis, Meg, 15. Novice, 1, S. Pugh, Jill, 5; 2, B. Lewis, Fan, 8; 3, K. Haker, Holly, 23; 4, J. Simmons, Conner, 34. Best beginner, 1, Philip Watson Jones, Josie; 2, P. Watson Jones, Mist. PONTRYDFENDIGAID THREE COUNTIES (Aurwen Price) 1, N. Watkins (Llanddeusant) Tanhill Alex, 12; 2, D. Jenkins (Talybont) Moss, 13;3, E.L. Morgan (Aberystwyth) Jaff, 14; 4, L. Evans (Bronant) Zac, 16; 5, C. Ridge (Narberth) Blue, 17; 6, J. Bowen (Tenby) Ned, 18. Young Handler, 1, D. Jenkins (Talybont) Bill; 2, L. Williams (Llandeilo) Ned; 3, T. Morgan (Mwnt) Cwmadog Bess. Team result, 1, Ceredigion, 213; 2, Pembrokeshire, 289; 3, Carmarthenshire, 296. PERTHYDUON BRECONSHIRE Nursery, 1, K. Evans, Jim, 12; 2, R. Games, Moss, 17; 3, K. Evans, Don, 20; 4, D. Evans, K. Tess, 21; 5, B. Howson, Grace, 23; 6, I. Jones, Ben, 24. Novice, 1, A. Lloyd, Jimmy, 15; 2, W. Jones, Spark, 33; 3, B. Howson, Val, 34; 4, D. Jones, Jock, 37. Beginner, Aneurin Harley, Skip, 39. DINAS DINLLE NORTH WALES (Judges, Bryn Davies and Rhion Owen) Nursery final 1, A. Jones, Jan, 11; 2, G. Jones Black (Sweep) 13; 3, M.McNaught, Sam, 16; 4, I. Thomas, Gari, 19 OLF; 5, A. Jarman, Pennant Cap, 19; 6, G. Ruggeri, Sweep, 21 OLF, 7, K.Schwarze, Brenig Wisp, 21; 8, J. Lightfoot, Nan, 22 OLF; 9, K.Scharze, Brenig Dot, 22 OLF; 10, J. Jones, Brenig Lad, 22; 11, G. Ll. Jones, Bob, 23 OLF; 12, J. Whiteley, Whisp, 23; 13, B. Willaims, Elwy Lad, 29; 14, V. Hughes, Glan y Gors Glen, 30; 15, P. Williams, Meg, 37 OLF. Reserves, H. Francis, Meg, 37, K. Davies, Sian, 40. November 13 GLANGWENLAIS Carmarthenshire, Nursery, Cilycwm, SA20 0TF, start 9am, contact L. Jones, tel: 07817 412 926. HIGH HOUSE FARM Glos/Gwent Nursery, Bryngwyn, Raglan, NP15 2BS. Contact P. Jones, tel: 07985 380 910. GLANIRFON FARM, Cilmery Breconshire, Nursery, Builth Wells, LD2 3NU, contact B. Abery, tel: 07773 192 283. DERRY LODGE, Ceredigion Nursery, Betws Bledrws, start 9am, contact R. Davies, tel: 01570 493 309. November 19 MAESYGELLI, Radnorshire Nursery, Elan Valley, start 10am, contact J. Simmons, tel: 07871 198 052. BROMSBERROW, Heath Glos/Gwent, Nursery, Ledbury, HR9 1PB. Contact A. Blackmore, tel: 07855 843 226. November 20 COLLEGE FARM, CARMARTHENSHIRE Nursery, start 9am, contact L. Jones, tel: 07817 412 926. TŶ DRAW GLAMORGAN Nursery, Nelson, CF46 6PG, start 9am, contact C. Millichap, tel: 07800 784 664.